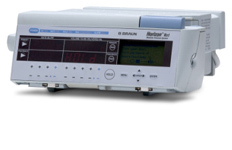 Save up to 80% on pre-owned B. Braun McGaw Horizon NXT infusion pumps. 12 Volt sealed lead-acid battery for ambulatory use. Run time is dependent on the state of battery charge and the rate of fluid delivery. Air-In-Line, Container Empty, Door Open, Downstream Occlusion, Hold Time Exceeded, Low Battery, Low Flow From Container, Close Roller Clamp, System Error, Upstream Occlusion. Permanent data retention after the pump is turned off, unless the battery is depleted or disconnected, or unless the data Retention Defaults have been otherwise selected in the Biomed Options.